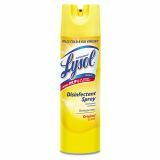 Professional LYSOL Brand Disinfectant Spray, Original Scent, 19 oz Aerosol, 12 Cans/Carton - Lysol Disinfectant Sprays kill 99.9% of the viruses and bacteria your family comes in contact with every day. Disinfectants can be used to eliminate germs on commonly touched hard and soft surfaces. 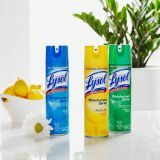 Lysol hospital-grade spray contains tuberculocidal, virucidal, fungicidal and bactericidal disinfectant and deodorant formula. Spray kills 99.9 percent of germs on hard, nonporous surfaces and is effective against more than 50 microorganisms including MRSA, Poliovirus Type 1, Hepatitis A, Hepatitis B, Norovirus, Rhinovirus, pseudomonas, HIV-1 (AIDS Virus) and influenza A (H1N1 Virus). Original scented spray eliminates odors and prevents growth of damaging mold and mildew and does not contain chlorofluorocarbons (CFCs). 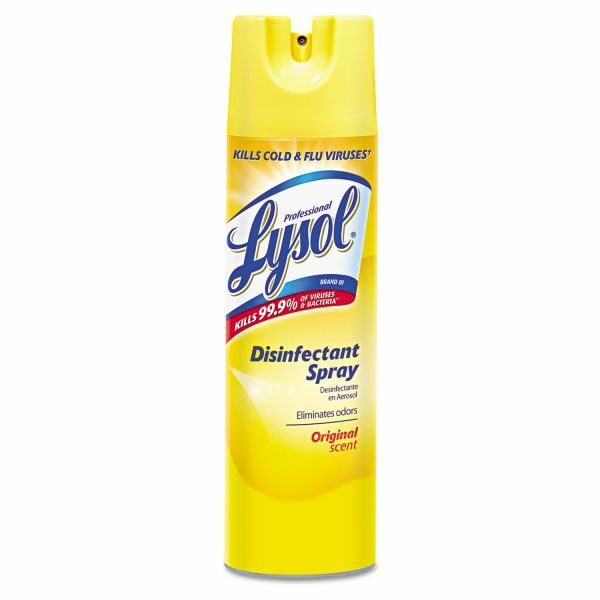 Use on showers, sinks, countertops, around toilet areas, toys, telephones, garbage bins, waiting rooms and in laboratories.